Stones Throw Bar the small sign read. The cozy space vibrated with music as people trickled in, filling up the spaces from which the music echoed. The atmosphere was pleasant with chatter, friends greeted and ran jokes, while some sat tuning in keenly to what Dj Jimmy Q was serving. When the venue seemed to fully come to life Brittany Brown, the host, took to the stage. 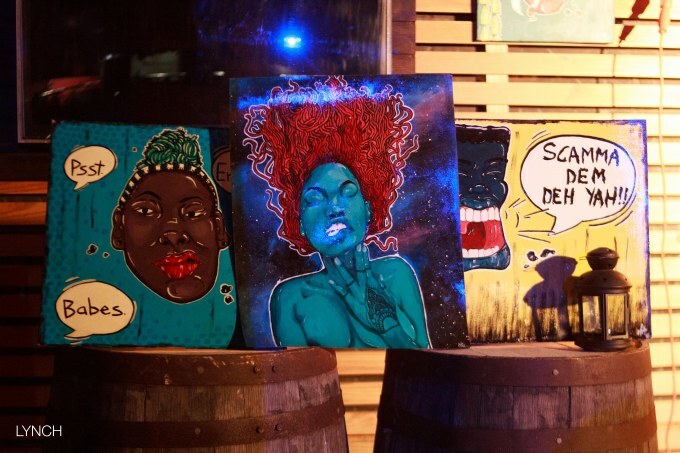 She introduced the artist that was responsible for the vibrant pieces that stood as décor, Monique ‘@Kidding_Art’ Kidd. She asked Monique a few questions about her work, which she gleefully answered, including how she started painting. The exchange ended quickly and without wasting time, Brittany introduced the first act, Mortimer. Mortimer came to Nice Up Di Scene, with a sweet acoustic vibe, he was accompanied by a solo guitarist, Elly B. 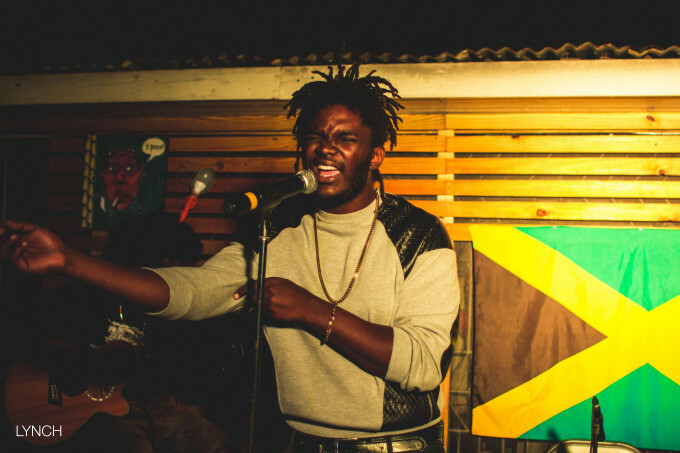 His soothing voice took off any edge that might have been in the air, the second song was his rendition of Protection, a song by Protoje of which he’s featured. Next he sang Herb For You, which sounded like a love song, maybe the love of herb transmitted very clearly through that one or maybe it was his voice wooing me. We saw a vulnerable side of Mortimer that night, he promised he wouldn’t do any long preaching but made it known that he had a lot on his chest. He actually became emotional while singing a song with the line “careful of the ones you call you family” the pain was evident. Which caused the audience to give him applause in encouragement, he then shared the lime light with Elly B, and gave him a chance to sing a song of his own. Mortimer finished up with his final song, Heads Up, leaving the crowd in high spirits. Lila Ike came with divine energy, femininity mixed with some ‘ragga muffin’ which lifted my spirit. I say ragga muffin because amazing lyrical mixing or Deejaying skills is usually associated with men but this little lady have it lock. She gained a new fan, me. She took us up and down with her vocals, her set included warm up which was Make a Joyful Noise, and lots of love: My Little Darling, Rain Start Fall, and Biggest Fan. She invited guests on for us, Koro Fyah which she sang Ragga Muffin with, and Royal Blu, to sing Believe. 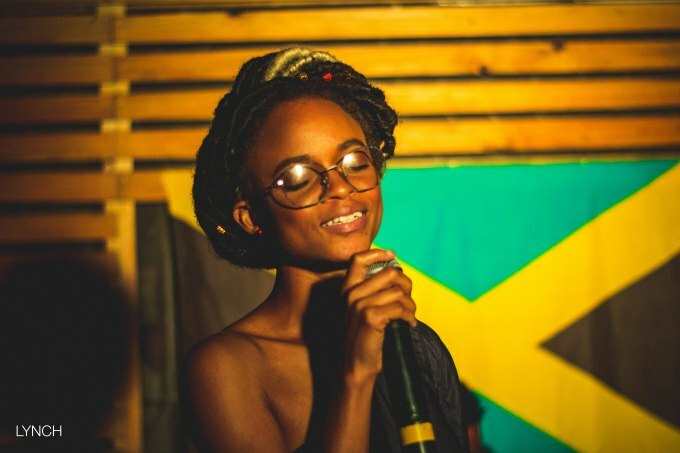 Her voice is so lovely, the audience was locked in, as she took us from sweet notes to mixing on the riddim. My faves were Biggest Fan and Rain Start Fall. To my dismay, most of these songs are unreleased, so when “my little darling” was stuck in my head the next day, me did get knock. I’ll just have to work with Believe for now…Word on the street, is that she will be releasing a single soon. Lila we ready fi you.